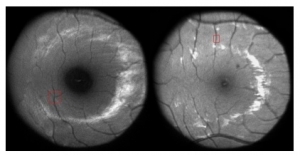 Intraocular scattering affects fundus imaging in a similar way that affects vision; it causes a decrease in contrast which depends on both the intrinsic scattering of the eye but also on the dynamic range of the image. Consequently, in cases where the absolute intensity in the fundus image is important, scattering can lead to a wrong estimation. In this paper, a setup capable of acquiring fundus images and estimating objectively intraocular scattering was built, and the acquired images were then used for scattering compensation in fundus imaging. The method consists of two parts: first, reconstruct the individual’s wide-angle Point Spread Function (PSF) at a specific wavelength to be used within an enhancement algorithm on an acquired fundus image to compensate for scattering. As a proof of concept, a single pass measurement with a scatter filter was carried out first and the complete algorithm of the PSF reconstruction and the scattering compensation was applied. The advantage of the single pass test is that one can compare the reconstructed image with the original one and see the validity, thus testing the efficiency of the method. Following the test, the algorithm was applied in actual fundus images in human eyes and the effect on the contrast of the image before and after the compensation was compared. The comparison showed that depending on the wavelength, contrast can be reduced by 8.6% under certain conditions.